This black and white photograph shows a group of U.S. Astronauts. 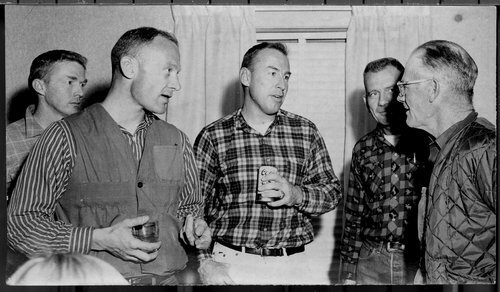 Pictured from left to right: Stuart Rossa, Edwin "Buzz" Aldrin in striped shirt, Captain James Lovell in plaid shirt and Donald K. "Deke" Slayton. The men are speaking with flying farmer Lyle Jones of Frankfort, Kansas, at the Dan Horigan home north of Frankfort.